The girls are enjoying their sleepover! If you think the photos are cute then you’ll love the reaction video! Isla and friends having a cosy night, we hope you had a fabulous birthday with your surprise sleepover. This was Aimee’s 9th birthday party a few weeks ago, better late than never though right? Our unicorn bubbles went down well with this trio!! Thank you for the photographs, we love to see the kids enjoying themselves. Kiera’s 9th birthday party is in full swing and the girls look like they’re having lots of fun. Little sister Skyler is enjoying the fun. Little Ava-Rose enjoying her set up ready for tonight. She’s a big girl now and is having a super duper sleepover for her 4th birthday. We hope you and your friends have a wonderful night. One of our little competition winners with her goodie bag. 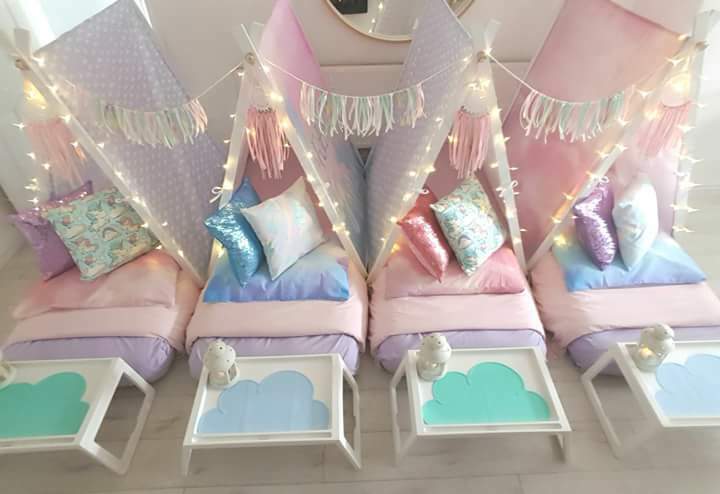 Ellie-Anne had her sleepover set up in her unicorn themed bedroom. What a dream come true it looked. Little Hallie enjoying her unicorn goodie bag. She likes the unicorn keyring best! Little Ellie testing out our “Magical Fantasy” unicorn headbands. Zoe and her friends loved their new “Instant Unicorn” headbands. Little Renea loves her new unicorn headband “Sequins and Roses” they are available as an optional extra for parties or as a stand alone item to purchase from our store.